With a gap week between Thanksgiving and December first this year, we thought folks might hold off on putting up holiday decorations. We were wrong. A few extra days added to the holiday season became the best excuse ever to get things started early. Crossland Landscape got busy turning the lights on in Ocean Park. 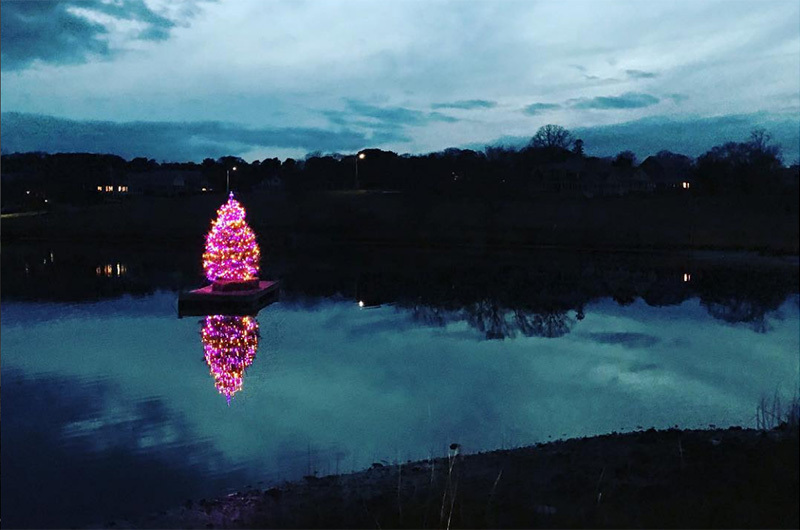 The tree went up on Sunset Lake. And last night was the Oak Bluffs tree lighting in Post Office Square. 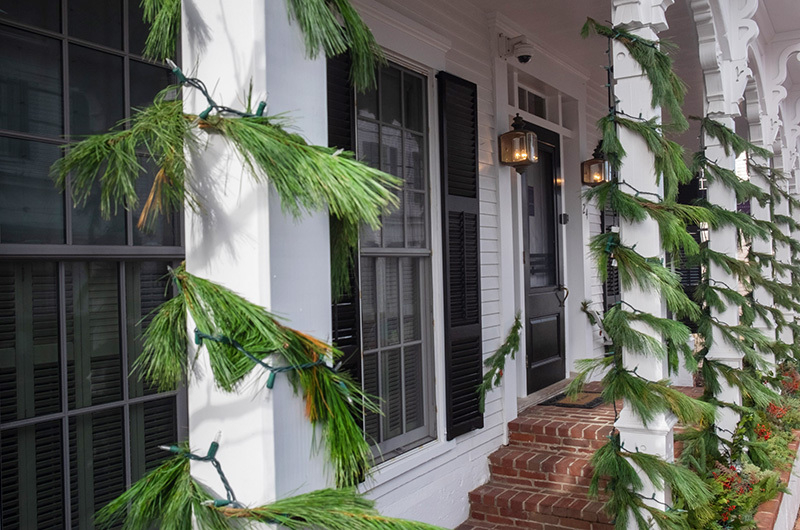 We noticed greenery popping up everywhere; pine swags suddenly festooned front porches in Edgartown and shimmied up lamp posts in Vineyard Haven. We began to feel a little panicky since we haven’t gotten started yet. 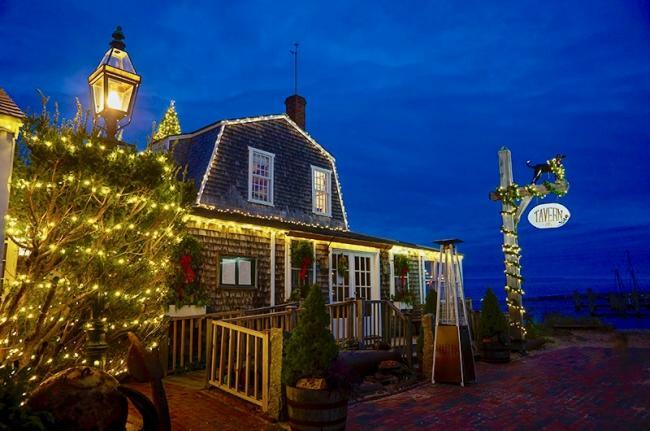 But then we looked at the calendar and realized there are plenty of chances to go green this weekend — starting with the Festival of the Wreaths at the Federated Church in Edgartown this evening. 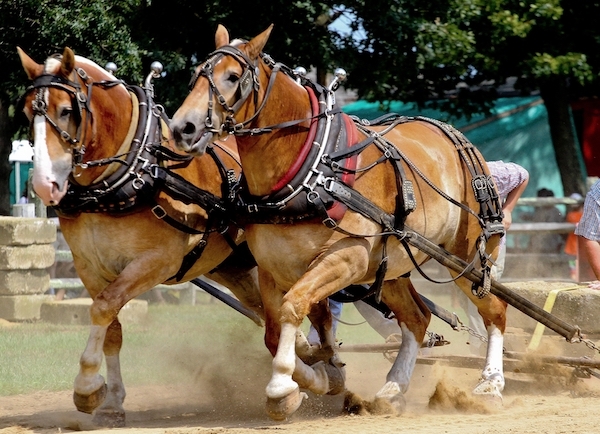 The event runs from 4 p.m. to 6 p.m., but you’ll want to arrive early. Wreaths go fast! If you miss that chance, remember Saturday is the annual Christmas Faire at the West Tisbury Congregational Church. Or you could even try your hand at making your own wreath at one of this weekend’s wreath-making workshops. Most important: The tree. Want to cut your own? Pile everyone in the buggy and pay a visit to L&W Tree Farm in West Tisbury on Saturday or Sunday between 9 a.m. and 2 p.m.
Start the day out with a little book shopping: The Big Book Giveaway is on at the Edgartown Library. Over in Vineyard Haven, visit the World Market Holiday Shop where your purchase of a hand-made gift helps raise money for women’s economic development in Haiti, Africa, India and Palestine. 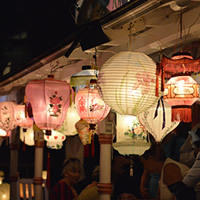 Take a drive around Ocean Park tonight to see the Crossland Annual Christmas Display. Then head for the movies: Boy Erased plays at the MV Film Center at 7:30 p.m. Widows, a heist thriller directed by Steve McQueen (12 Years a Slave) with an all-star cast that includes Oscar winner Viola Davis, plays at the Capawock at 7 p.m. and at the Edgartown Cinema at 9 p.m.
Drop your letter to Santa off at Edgartown Meat and Fish this morning. Visit the winter farmers’ market at the Ag Hall (10 a.m. to 1 p.m.) and the Christmas Faire (9:30 a.m. to 2 p.m.) before hitting the holiday pop-up shops down-Island. 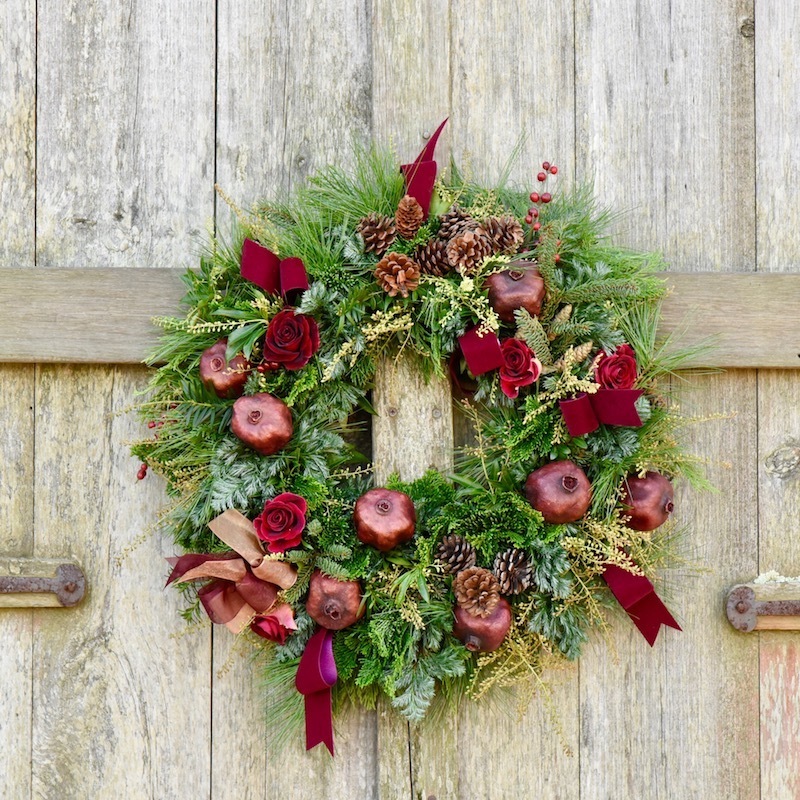 Morrice Florist hosts two wreath making workshops this afternoon at noon and 2 p.m. The Featherstone Holiday Gift Show is open from noon to 4 p.m. today. Art lovers can check out opening receptions today for Whitney Cleary’s oils at the Chilmark Library (2:30 p.m to 4:30 p.m.) and Bruce MacNelly’s paintings and drawings at the MV Playhouse (5 p.m.). Tonight at 7:30 p.m. the Island Community Chorus performs its first holiday concert at the Old Whaling Church. (The second will be tomorrow at 3 p.m.). Over at the MV Film Center, Can You Ever Forgive Me? is on screen at 7:30 p.m. So many good ways to get out and about today: The open house at Island Alpaca (10 a.m to 4 p.m.), foraging for wreath materials in Menemsha Hills (11 a.m. to 1 p.m.), a winter walk wtih VCS at Waskosim’s Rock Reservation (1 p.m. to 3 p.m.), and a Winter Solstice Hygge Potluck at Felix Neck (3:45 p.m. to 7 p.m.). Inside, your viewing options are excellent: Watch The Bolshoi Ballet perform Don Quixote via the big screen at the MV Film Center today at 12:30 p.m. Take the kids on a polar adventure via an Interactive Holiday Movie at the Vineyard Haven library at 2 p.m. Or catch the Island Community Chorus concert at 3 p.m. Photos: Sunset lake, Liz Dolan Durkee; pine swags, Mark Lovewell; wreath, Jeanna Shepard.